Four times a year the wonderful people at Art House Productions invite the Jersey City arts community to open their doors and share their work with the public. Zack and I are proud to have been apart of this June’s event. We’ve only been in JC for less than a year and we already feel richly connected to this side of the river. Thank you JC for the warm welcome! Our event, titled Bergen Hill Sound/Image, included video art and performance work by Nyugen E. Smith, myself and Zack Lischer Katz. In addition two Rogue Video curators, Marie Sullivan and Meghan Blowers, presented a video piece including 20 artists from around the world, titled, “Trashed”. Too Many Frets and members of Smoove Sailors and Stars Bars & Mars rounded out the event filling the space with hypnotic blends of avantgarde drone and funk. 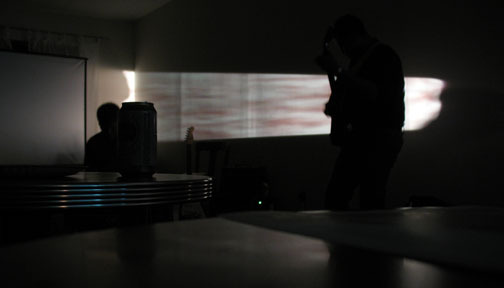 Thanks to Zack Lischer-Katz for projecting his beautiful Brakhage-esque handpainted 16mm film – that was the highlight for me! The evening was a great success! A big thanks to our host Jean-Franck Maurice who opened his space to us for free! It’s available to rent at Bergen/Hill at Communipaw and Grand. Check it out! Thanks to everyone who helped and contributed their time. Here’s to JC!